Loved this hand. River is an interesting spot to try a large bluff imo. I designed this tighter than I normally would due to table notes. LAGs never fold preflop after limping, especially suited cards. Top set? Check-raise, TAGs love to check-raise monsters and LAG is in the hand, will often bet if checked to. I left 25% in to be safe. Second pair? Not in range. Straightforward TAGs hate when a flush card comes down (no matter how unlikely it is we have it). They probably will go into check-call mode with their whole range, even sets and rivered 2 pair. The best play here is to bet big. KQ turned into middle pair on the river, that’s 18% of his range, and AK turned into two pair. We can hardly ever have a flush here (Td9d is the only candidate hand), but this V probably isn't hand reading. Two pair makes up 55% of his range. I bet pot and hope V can talk himself into a fold with KQ and sometimes AK. MP2 Spewy Lag limp-call w/..
Monster Pairs? Yes. TT+ In order to attempt to trap SB Boring Tag's range. Would they bet oop in a MW pot w/..
JJ? No. I don't think predictable boring tag cbets here w/ anything less that TP being that he's oop w/ 2 players behind on a K high flop w/ a few clubs present he likely thinks if he bets then a K, QQ can call which one of us more likely the spewy lag could've had a K easily. What's SB likely to do w/..
TP? Bet. Standard Value bet TP makes up the majority of his range at this point. What would I do here as-played? Well since there's now other way to win the pot I think I'd try and bluff shove the river. If I think that he'd bet AK, KK, 99, AA so he likely doesn't have them. I've narrowed his range down to KQo,KQs-KJs. With his range capped at KQ he has 62.5% equity. If I jam $430 into $220 (just under 2x pot) then he would need 57.7% equity to call. I need him to fold between 60-66% of the time. So although he does have just a little equity over the needed percentage to make a correct call I'd imagine it would be rather frustrating oop facing an all in bet w/ at best KQ. I think he may fold just enough %age of the time for this to be a profitable bluff. As always would appreciate feedback, what do ya think? Are you guys jamming here or just checking behind? You decide to limp behind a few limpers with T8s but to your surprise the SB raises. When building this range try to figure out what is the worst pocket pair and the worst Broadway hand they would raise over 4 limpers from the blinds with. What do you think the SB is likely to do with the following hand strengths? What would you do here as-played? I would bluff. I don't think he is real strong here and afraid of the board, especially the ace on the river. With a 2/3 pot bet I only need to win 40% of the time and I think I do. Double check your flop. The missed suit may just be a transcription error. I did come to the same conclusions as the three posters above. Their range is capped at KQ-KT. A river pot bet or shove looks like called down with the nut flush draw and binked an Ace on the riv. I did love this hand exercise. Without working it off table, I don't think I would've ever seen the bluffing opportunity. As I merely agree with the previous posters I won't put my ranges here. I would disagree on some detail (like would V opens with 98s? ), but most of all I'm ok. I want but point 2 things you apparently didn't consider much or didn't write down. Now if we remember a major @Doug Hull point: bomb the limper! 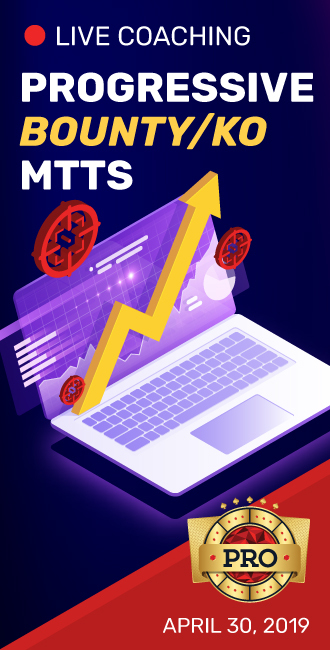 With a minimum 10x bet. So for sure V1 doesn't know Doug Hull :) as he would have sized bigger. And maybe he didn't study much his preflop play. For that, I think it's coherent to think that his SB raise range may not be very different than an usual one. I wouldn't put many AXs or KXs (good squeeze potential bc blocker) for example. His range may be : AA-77,AKo-ATo,KQo-KJo,QJo,JTo,AKs-ATs,A4s-A3s,KQs-KTs,QJs-QTs,JTs,T9s,98s. But I'm not sure about the weakest part of this range (like JTo or 98s). Also, because he didn't seem to study much, I expect a fit-or-fold play, esp. on Turn and River (I expect many flop C-Bet). Many advocate for a River bet. Because Villain shows weakness (check) and/or because we can't win with T8s. Now there is 2 things I disagree with. I think bluff shoving is too big. 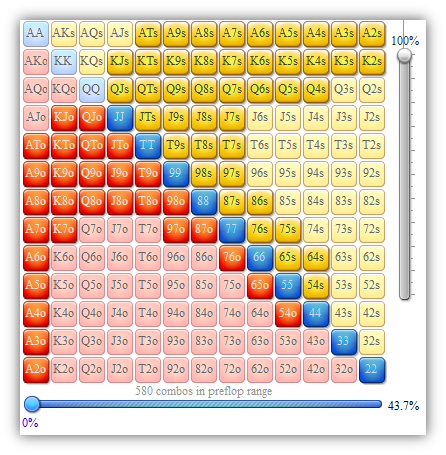 If we shove 375 into 220 pot, we need Villain to fold 63% of the time to be +EV. 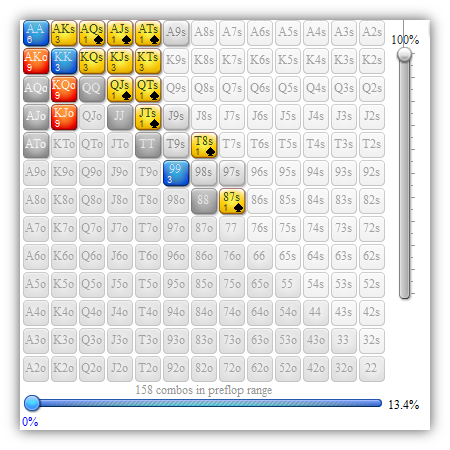 On "my" river, Villains has 27 combos of KX (KQ, KJ and KTs) and 18 combos of 2P (AK) and sets (KK, 99). Even if Villain fold ALL his KX - which I wouldn't say for sure - we still have only 60% FE... so under the 63% required. (And I don't expect him to fold AK for further FE). Instead, I propose a pot size bet. We still represent a strong holding, but we need Villain to fold "only" 50% of the time to be +EV. So he still can call sometimes with KX we are doing a +EV bluff when he fold most of his KX. We also have to be sure Villain can fold. For him to fold after 2 streets of value - a river check isn't a promise to fold - , he needs to think we are strong enough of the time. Fact is, the flop is dry outside the FD. And this FD bricks. So what value (i.e. better than KX) do we have? -> AX ? I expect us to open preflop with all AXs from CO. So we shouldn't have them. Plus if we have AsXs on the turn, we still can pay a 60% pot bet as with 12 outs (9 for FD + 3 A) we have only 26.09% equity. Not enough compare to the 27.27% pot odds we have. Plus we shall discount some % of A as he will hit them sometimes with AK. -> flush? But do we call a naked bckdFD on the flop? And then on the Turn? I lean toward a bckdFD+pair, but then we only can have 4 combos of flush on the river (Qd9d, 9d7d, 5d3d and 4d3d). NB: I would open with J9s, T9s, 98s so I don't have them here. -> 2pairs? Ks6s for sure. Maaaaybe K9s. But this is 1 (or 3 combos) only. Not we can count than Villain is not smart enough to see that if we bet the pot, he need 33% equity to +EV call. And if we bet 50% value ( and 2P K6) and 50% bluff (which gonna be beaten by Villain's worst KX i.e. KT), Villain still has ~47% equity - as said, we don't have enough strong hands - enough to be a +EV bluff catcher. B: Conclusion, do we bluff? On one side we can try to abuse Villain. He could see monster under the carpet and fold. On the other side, if we play standard, we are going to be too weak. Now I think a bluff is +EV only if we can abuse Villain, if he is not able to hold with KX. I looked hard for a bluffing opportunity here, but I'm not finding it. At least in my experience, the TAG regs aren't pumping much from the SB. I gave him 88+, AJs+, AQo+ and KQs+. And really, that felt a little wide to me for this player type. AQo and KQs are on the cusp. As played to the river, the only hand it seemed to me we could possibly budge is KQs. The sets, 2p, and even rivered top pair could be checking because they're MUBSy about the backdoor. Or they could be checking to induce the spades. Preflop SB would be very tight here. Monster pairs? Definitely not limp call. If did have Monster pairs and jost to limp it would be to do a limp reraise. Boring TAG is about 17/11. He will iso with valuehands. I don't think this boring TAG has bluffhands in his range. Because until now he hasn't shown any action. So we give him credit for a strong hand. 133 combo's. 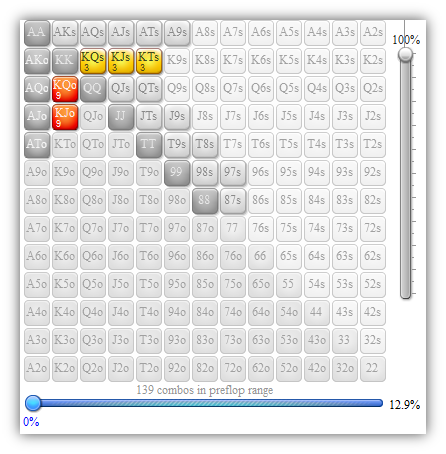 10,9% of the starting hands. On Kd3s9s he will cbet with TP, OP, sets and pocketpairs that are 2ndPair = TT, JJ and QQ. FD's are only 6 combo's!! Ahigh he will not cbet. 65 combo's. 56% of his prf-open range. Now his betsize is 60%, so a bit larger than his cbetsize. His sets he would make a bigger betsize, so I give the sets a filter of 50%. 2ndPairs he would check or bet 1/2, so I take these 2ndPairs out of his range. Ad, so the FD busts. With 2Pair (AK) he would have 3rd barreled for value. So I take AK out of his range. With all sets he would have 3rd barreled for value. So I take the sets out of his range. Only 2 combo's are left in his range AsQs and AsJs. I don't beat those hands and SB is an ABC-player. I will make a bet and hope that he will find the fold-button. That he is afraid of me, because of the fact that I called all his bets and that he thinks that his TP is not enough. Good question is the betsize. I think an overbet is good. 1.5 pot or 2 pot. But in case he won't fold, you have spoiled a lot of money, without any need, because you should have folded preflop. There is still the chance that he trapped you and hopes that you make the bluffbet and then he raises you and you have to fold. I think you overplayed your hand. If you would have hit your flush, he will probably not pay you off. Or he has a better flush himself. I think versus a boring tag that suddenly awakes, you have to fold a mediocre hand like 8Ts. Give him credit for a strong hand. Preflop: Boring TAG in the SB raises over 4 limpers. What’s his range for that: 13% range (157 combos) AA-88,AKo-ATo,KQo-KJo,QJo,AKs-A9s,KQs-KTs,QJs,JTs,T9s. The worst pocket pair is 88 and the worst broadway is ATo. Spewy Lag in MP2 calls and I call in the CO. MP2 is limp-calling with speculative hands only, so not Monster pairs, but yes to Ax and KQ, KJ, KT. The TAG in the SB CB ½ pot ($25) MP2 folds and I call. 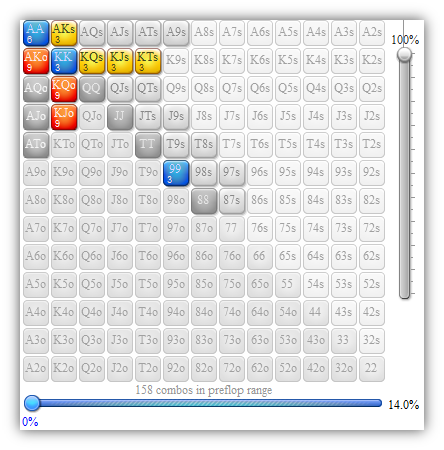 The TAG moves ahead only with the goods, otherwise he would check-call or check-fold: 39% of previous range (53 combos) AA-KK,99,AKo,KQo-KJo,AKs,KQs-KTs,AsQs,AsJs,QsJs. Against his range I am at 33% to his 67%. His could have been a value bet instead of CB. He would CB with top pair, Top set and JJ. TAG bets just over ½ pot ($60). He does this with top pair and sets but not second pair. His range remains at 100% of previous (53 combos) AA-KK,99,AKo,KQo-KJo,AKs,KQs-KTs,AsQs,AsJs,QsJs. My equity drops to 25% for my hand vs 75% for his range. I call, I must be holding out for that flush. TAG checks, perhaps he has KK this whole time? According to Equilab I got nothing on him but a casual look at the board tells me that too. Fortunately I can just check back. I think TAG would have bet AK or a set, he did not so I adjust the range even though the exercise is over, AA-KK,AKo,AsQs,AsJs. I would bet pot-sized as a bluff off the River Ad scare card (not really, I’d be too scared, but here it’s OK). I am realizing that I should have taken into account what all my previous calling would look like to the TAG. I need to add that to my scenario and future thinking. raising. The SB is an ABC-TAG who has not gotten out of line at all. Monster Pairs? No, too far from UTG to tempt this move. AXs? Possibly some of them yes. As played, I would fold. There is no bluff on V range. Agreed. It's always tempting to fire when he checks. First off, if he's ever checking his sets and AK then a river bluff is burning money. But even if he's capped at KQ I'm not sure we're generating enough folds. If I was gonna go aggro it wouldve been earlier in the hand. At this point he bet the turn so his range is too strong and I would let it go.